Search engine optimization (SEO) refers to technical measures that are taken to increase traffic to a website. Content marketing refers to brainstorming and content creation to increase user engagement and drive profits. Now, content marketing is a part of SEO. If a website has good content, it is likely to have a good search engine page rank (SERP). However, there’s more to SEO than just content. Tare other factors that contribute to a website’s overall search engine visibility. 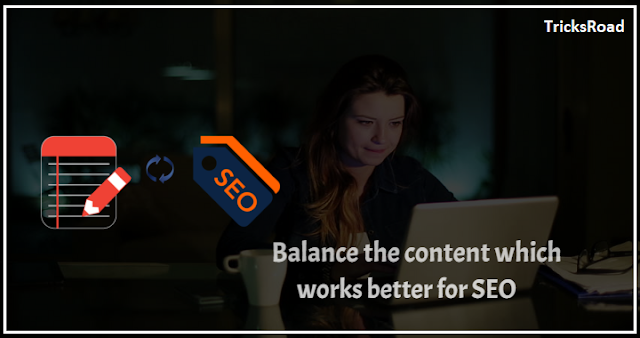 Below are some tips on how to maintain the right balance between content creation and other marketing strategies when it comes to improving a website’s SEO. SEO content is created keeping search engines in mind. However, marketing departments tend to forget that their customer base is not searched engine bots but actual humans. Content that fails to engage its audience’s attention is not really doing its job. Moreover, even search engines prefer fresh content that is engaging and adds to debate. If the content is excellent, it is indexed faster. Good content should be creative. It should be built around the audience and its interests. It should answer queries that people have regarding a product. However, the information provided should be factually accurate and based upon research. Consumers are quick to spot marketing gimmicks. It should be optimized with meta descriptions and keywords using a tool such as Google AdWords. However, it should not be bland and structurally awkward. It must entertain the target audience while giving them new information about a particular niche. Plagiarism is a no-go. Search engines give low page rank to content that may appear to be replicating the content of another website. Even copywriting should be original and unique. Moreover, the content should be easy to read. This is not to mean it should follow basic grammatical structures. Instead, it should be well formatted. You can put a lot of hard work into brainstorming regional ideas and curating content, but if you do not know how to present it, then it’s kind of a waste. Modern consumers lack the patience to read long patches of text. They want to skim through a text. Hence, content should be broken into small paragraphs with liberal use of bullet points, line breaks and highlighted elements. Header and title tags also make it easier for users to read the text and since they are a part of a website’s code, they even interact with search engine robots. This makes it easier for them to crawl a webpage. The content on a website and its optimization are called on-site SEO. On the other hand, there is an off-site SEO that refers to backlinks. These backlinks can be purchased but search engine bots are quick to catch on to such tricks. This can lead to a website being blacklisted. Instead, these backlinks should be developed organically through guest-posts and collaborations with bloggers and influencers. In case a company wants to devote its efforts to other departments, off-site SEO can be outsourced from digital marketing companies such as Healthy Links. They get in touch with bloggers who are offered incentives for promoting products on their website and social media channels. This way, the blogger’s credibility drives traffic to a site and increases the revenue of a company. Inbound links are also effective. The content within a website should be connected through hyperlinked sections of text. This highlights keywords and helps search engines crawl webpages. Search engines care about the mobile-friendliness of a website. Look around your social circle, and you will realize that most of the people use their smartphones to surf the internet and search for their queries. Now, if a website doesn’t have a format that is compatible with smartphones, then it will result in negative votes. If users rate their experience on a site poorly, then it may also get low page rank. Moreover, the user experience of a website also depends upon its loading time and effectiveness. Nobody likes advertisements and popups that open in the background. They may interrupt someone’s stream of thought and are considered a major turn off. From a graphic design perspective, the text on a website should be written in a simple font. Widgets and plug-ins shouldn’t give an appearance of clutter, and the overall design should be minimalistic. Fancy themes may be attractive, but they jeopardize clarity and in turn, the overall user experience. The text is often broken using images. In fact, social media users are more likely to click on a link if its image preview is attractive. Sure, headline matters but a powerful image has a better chance of catching people’s interest. However, any old image won’t do in content marketing. The images featured on a website should be of good quality. No blurry or copyrighted photographs. They are considered bad for the website SEO. If no good quality image is available, then a representational image can be purchased from image repositories like Getty Images and Shutterstock. To optimize them, images should have meta descriptions and tags included to interact with crawlers. They should always be named to indicate what they show rather than given a random name comprising of odd numbers. These tricks give pointers to a search engine what a content page is about and how to rank it. The URLs on a website should also be optimized. This can be done by making the slugs (the part that comes after the .com) concise. This facilitates search engines in categorizing parts of a website according to their relevance. A sitemap is also a valuable SEO tool. In basic language, this is an XML file that lists all the URLs on a website in a hierarchical manner. The functionality of a sitemap is that it makes the job easier for website crawlers which improve the SEO.